Please read the CEO.CA House Rules before posting. The information on this Website is not reliable and not intended to provide tax, legal, or investment advice. Nothing contained on the Website shall be considered a recommendation, solicitation, or offer to buy or sell a security to any person in any jurisdiction. CEO.CA members discuss high-risk penny stocks which can lose their entire value. Only risk what you can afford to lose. © 2016 - Pacific Website Company Inc.
VANCOUVER, British Columbia, Jan. 21, 2019 (GLOBE NEWSWIRE) -- Westhaven Ventures Inc. (TSX-V:WHN) is pleased to report drill results from its recently completed drill campaign at its 15,542 hectare Shovelnose gold property, located within the prospective Spences Bridge Gold Belt (SBGB), which borders the Coquihalla Highway 30 kilometres south of Merritt, British Columbia. The program consisted of 5 holes totaling 2,183 metres of diamond drilling. Also included are assay results from two holes (SN18-16 & 17) drilled previously. SN18-16 returned 2.38 metres (m) of 16.80 g/t gold (Au) and 40.90 g/t silver (Ag). SN18-18 returned 13.67m of 4.29 g/t Au and 21.87 g/t Ag, including 3.27m of 15.35 g/t Au and 75.72 g/t Ag. ○ 8.00m of 6.81 g/t Au and 22.29 g/t Ag, including 2.20m of 18.79 g/t Au and 23.57 g/t Ag. ○ 2.85m of 5.54 g/t Au and 63.51 g/t Ag. ○ 0.77m of 9.18 g/t Au and 79.70 g/t Ag. SN18-21 returned 12.90m of 12.11 g/t Au and 94.31 g/t Ag, including 1.40m of 92.80 g/t Au and 641.54 g/t Ag. SN18-22 returned 5.35m of 8.79 g/t Au and 32.34 g/t Ag. Drill hole SN18-18, an upper cut of SN18-14 (17.77m of 24.5 g/t Au, 107.92 g/t Ag), extended Zone 1 up-dip from SN18-14 by 97m (3.27m of 15.35 g/t Au, 75.72 g/t Ag) and first intersected Zone 2, 150m down-section from Zone 1 (2.20m of 18.79 g/t Au, 23.57 g/t Ag). SN18-19 collared 100m southeast of SN18-15 (46.2m of 8.95 g/t Au, 65.47 g/t Ag) encountered the uplifted root of Zone 1. IP surveys southeast of here will assist in targeting down-faulted strike extensions of the vein system beyond this area of significant cross-faulting. SN18-20, an undercut of SN18-15, extended Zone 1 down-dip by 140m, below the shallower horizon of stronger gold mineralization encountered in hole SN18-15. Hole SN18-20 also tested Zone 2, 100m down-section from Zone 1, encountering anomalous gold and silver despite the significant depth (0.52m of 0.38 g/t Au, 94.31g/t Ag). SN18-21, an undercut of SN18-14, extended Zone 1 down-dip by 50m from SN18-14 (12.90m of 12.11 g/t Au, 94.31 g/t Ag). SN18-21 also extended Zone 2 down-dip by 170m from SN18-18, encountering elevated gold despite the depth here (1m of 4.69 g/t Au, 1.61 g/t Ag). SN18-22 is collared 100m northwest of SN18-14 and encountered the northwestward continuation of Zone 1 (5.35m of 8.79 g/t Au, 32.34 g/t Ag) and Zone 2 (0.8m of 2. 91 g/t Au, 2.88 g/t Ag). Please refer to the plan map of the drilling program below. In summary, high grade gold and silver mineralization discovered by Westhaven Ventures is present at the Shovelnose South Zone, one of many gold bearing prospects on the claim block. Mineralization occurs in two subparallel epithermal quartz veins and related zones of quartz vein stockwork. Together, diamond drilling has intercepted gold mineralization related to these vein zones over a distance of 720 meters along strike and over a vertical extent of 320 meters. 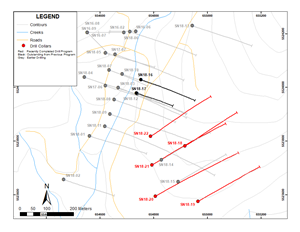 Within the 720 meters of gold mineralization (between SN18-15 and SN16-08) Westhaven can confidently track the vein zones over 320 meters of strike length from SN18-15 to SN18-12 where drill holes cut the zone at oblique angles. Infill diamond drilling will be used to further delineate these zones northwestward. Drilling to date is limited so true widths cannot be definitively determined. However, based on the strike of the vein zone with a steep dip to the west, true widths are estimated to be about 80-90% of reported interval lengths. Westhaven owns a 100%-interest in 4 properties covering over 35,000 hectares within the prospective SBGB, which is situated within a geological setting like those which host other significant epithermal gold-silver systems. It is close to major transportation routes and infrastructure allowing for cost-effective exploration. The SBGB is a 110-kilometre northwest-trending belt of intermediate to felsic volcanic rocks dominated by the Cretaceous Spences Bridge Group. Sable Resources and Westhaven have a combined control of 86% of the SBGB (225,000ha). Any ground staked by Sable within 5 kilometres of Westhaven&apos;s existing projects is subject to a 2.5% NSR. In addition, Westhaven has a 30-day Right of First Refusal (ROFR) on any properties outside this 5-kilometre radius. Peter Fischl, P.Geo., who is a Qualified Person within the context of National Instrument 43-101, has read and takes responsibility for this release. Core samples were prepared using the PREP-31 package in ALS’s Kamloops facility each core sample is crushed to better than 70 % passing a 2 mm (Tyler 9 mesh, US Std. No.10) screen. A split of 250 g is taken and pulverized to better than 85 % passing a 75 micron (Tyler 200 mesh, US Std. No. 200) screen. 0.75g of this pulverized split is digested by Four Acid and analyzed via ICP-MS (method code ME-MS61m (+Hg)), which reports a 49-element suite of elements. All samples are analyzed by Fire Assay with an AES finish, method code Au-ICP21 (30g sample size). Additional Au screening is performed using ALS’s Au-SCR24 method, select samples are dry screened to 100 micron. A duplicate 50g fire assay is conducted on the undersized fraction as well as an assay on the entire oversize fraction. Total Au content, individual assays and weight fractions are reported. All analytical and assay procedures are conducted in ALS’s North Vancouver facility. A QA/QC program included laboratory and field standards inserted every 25 samples. At least one field blank is inserted in every batch of 25 samples, with additional blanks inserted following samples with visible gold. Sign up to become a contributing member of the community. Share knowledge and track stocks in real-time among CEOs and market pros. Please download our app to enable push notifications. Only panel members are allowed to post in this channel. Your account must be verified before you can post. Your claimed user handle is . You have not reserved your username yet. Drag & drop companies & categories to customize the order. This page is for listing the channels with most users online. This feature is restricted to CEO.CA Pro subscribers. We will soon introduce a cheaper Pro package without Level 2 data, to accomodate for users who do not wish to use our market data products. Market depth is not enabled for . Get CEO.CA Pro to gain access. You must verify your email address before choosing your payment plan. No Wiki page exists yet. first. loading... You haven't created any articles yet. Success! You now own . What handle would you like to reserve for yourself? How much do you value this user? Public channels are visible & open to all members. Private channels are only visible to invited members. Panels are visible to all users, however only invited members are allowed to post. Name your new channel below. Sign up to CEO.CA Pro Accounts and get Insider activity in your email. You can enable the watchlist category "" for sharing. After turning sharing on, the watchlist will get its own chat channel, with the companies listed on the same page. Only you can see the watchlist category "". Watchlist sharing will be OFF. Only you will see the watchlist category "". Your watchlist category called "" is private. Only invited users can see it. Your watchlist category called "" will be private. Only invited users will see it. Your watchlist category called "" is public. Your are making your watchlist category called "" public. Paid watchlists are still under construction. We are planning on letting our users charge their subscribers a custom fee. Until then, you can gain a following with public watchlists. Your whatchlist channel has been created. /green' : 'varying degrees of red/green' %>.